The cosmic scale, verdant islands, blue lagoons and brilliantly coloured underwater life of the Great Barrier Reef have attracted and intrigued visitors from the very earliest European navigators to the two million tourists who visit the region each year. Despite its timeless appeal, the pleasures of these landscapes changed significantly during the twentieth century. Patterns in tourist landscapes have been determined by transport, infrastructure and conservation. They have also been driven by human imagination. 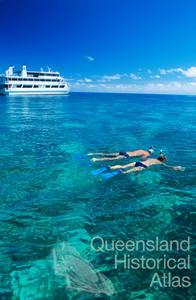 One of the greatest changes to visitor experiences of the Great Barrier Reef is the perception of landscape. The significance of the Great Barrier Reef World Heritage Area largely rests on its status as a single entity; a vast and complex landscape. 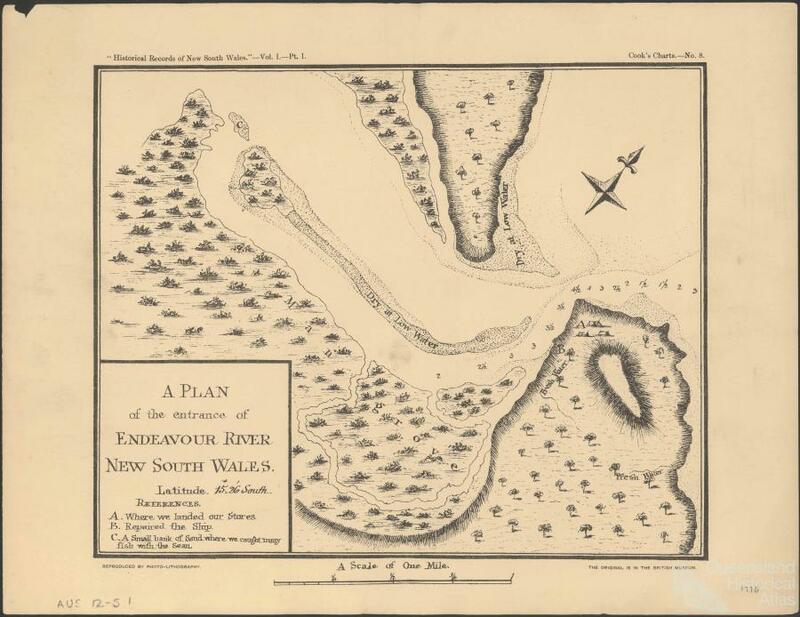 In contrast the earliest charts of the Reef – drawn up during the voyage of the Endeavour suggest the intimate complexity of localised corals, shoals and reefs. 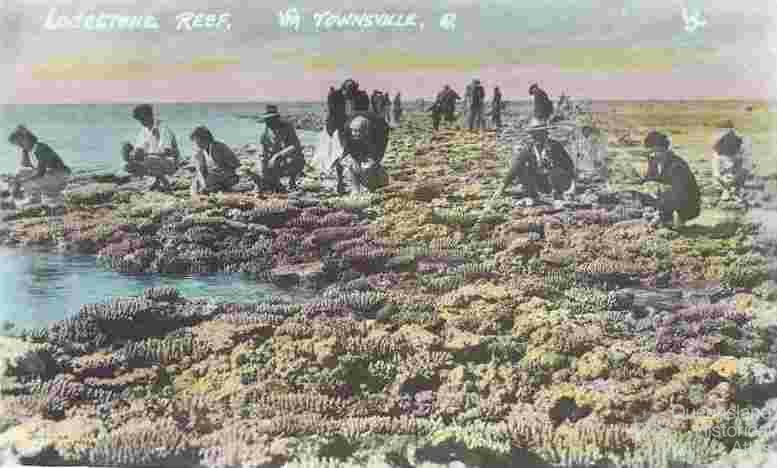 Cook referred to the region as ‘the Labyrinth’ and in later decades it was referred to as the Great Barrier Coral Reefs, suggesting a multiplicity of locations and features. 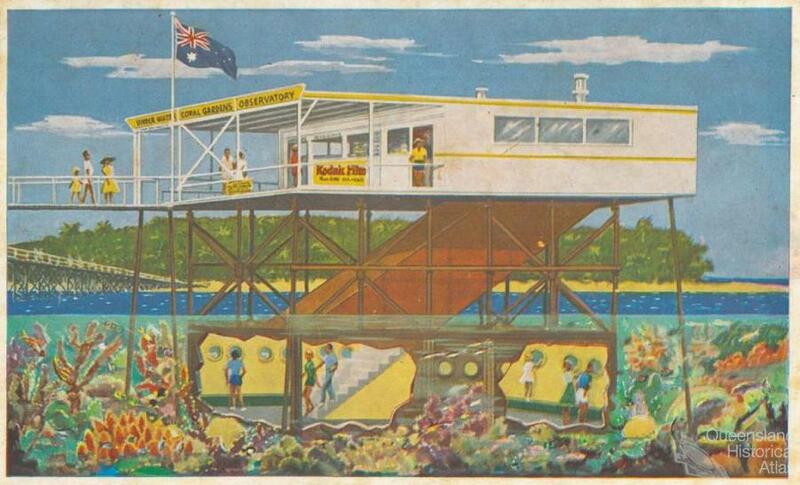 This multiplicity of location was a large part of the attraction for early tourists and contributed directly to the enjoyment of early Reef holidays. 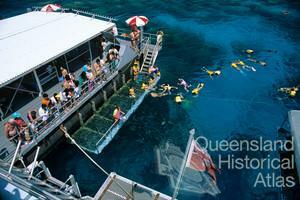 In the early twentieth century a holiday to the Reef was a major investment in time. 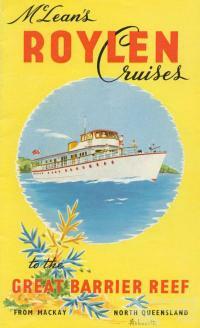 Most visitors came from the southern states, travelling long distances by road, rail and sea. The long journey became an important marker of the distance travelled and was characterised by changes in weather and vegetation. The journey was important for its own pleasures and for a sense of being far removed from home. 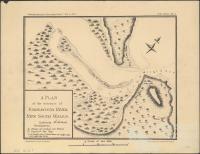 Once in the general vicinity of the Reef, further travel was required to reach the islands. 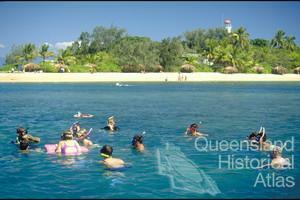 Visitors were transferred through ever smaller vessels as they made their way closer to shore over shallow reefs. Weather and tides were of the utmost importance in deciding arrival and departure times. In other words, holidaymakers had a strong sense of orientation, and of the rhythms and cycles in the landscape. Holidaymakers often based themselves on one island and made excursions into the surrounding area by launch or dinghy. The base camp was necessary because freshwater and shelter are rare on the Reef islands. So visitors often relied on the infrastructure established on the islands by pastoralists or other industries. In places like the Whitsundays and Capricorns visitors used the sheds and water tanks established for pastoral runs and turtle canneries. 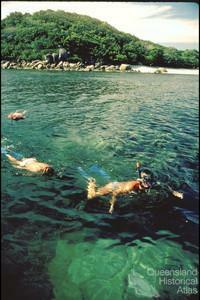 From these base camps visitors travelled further to explore the surrounding islands. Following the example of James Cook, they climbed to the summit of continental islands to view the shoals and reefs and mark their own place in the landscape. They made numerous excursions to neighbouring islands and scenic lookouts. They came to understand the scale and complexity of the Reef. Their strong sense of locality is shown in the detailed maps produced by and for holidaymakers in the 1920s and 1930s. 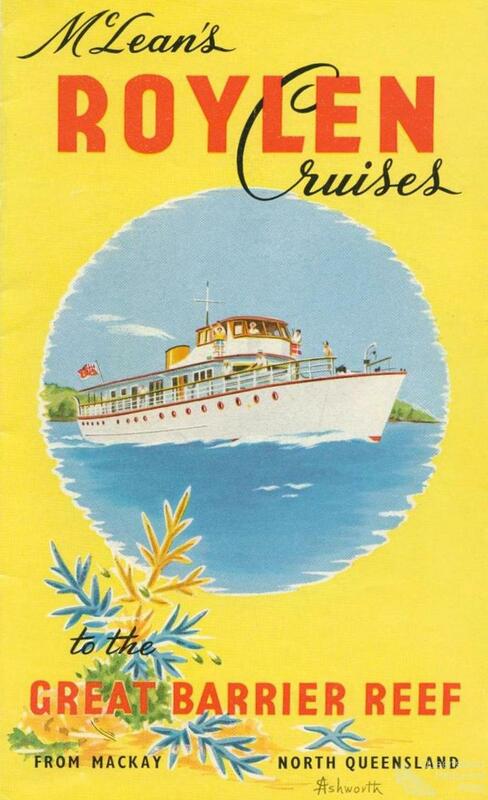 The voyage of the Cheerio in 1935 was one such excursion. A group of 26 women and men holidayed together in the Whitsunday region, travelling between and camping on the many islands of the region. They produced a map to show the locations they visited and the direction they travelled. Several members of the group wrote essays about their experiences, including some that were published. These accounts demonstrate a sense of location, thrill of adventure, companionship and discovery that typically characterise early twentieth century Reef holidays. 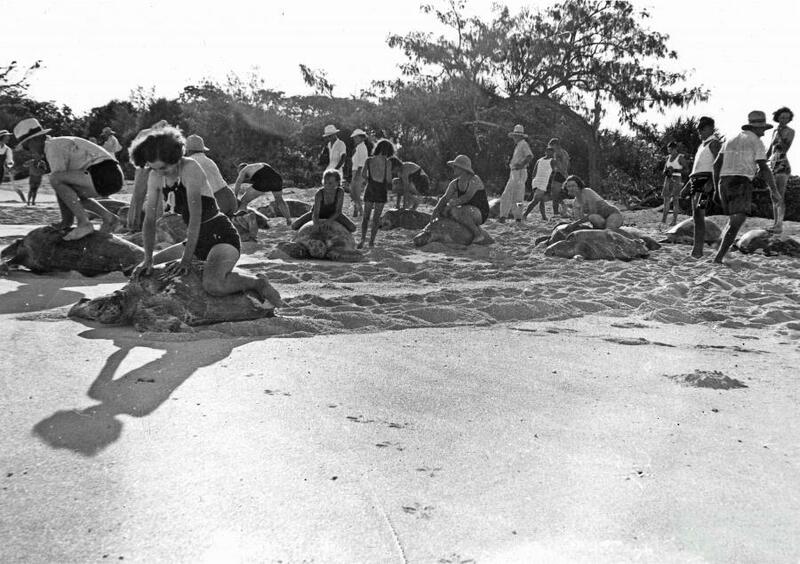 The limited nature of infrastructure on the islands not only determined the location of the base camps, but also shaped some unique Reef pastimes. Many holidays in the 1920s and 1930s were organised around scientific expeditions – partly because of the absence of tourist facilities or transport. As a result early tourists became directly involved in scientific exploration and discovery. They were excited by the underwater world, but had very limited access. They viewed the underwater by peering into still coral pools exposed at low tide or through the small glass window of a waterscope. A close-up view meant bringing creatures to the surface. 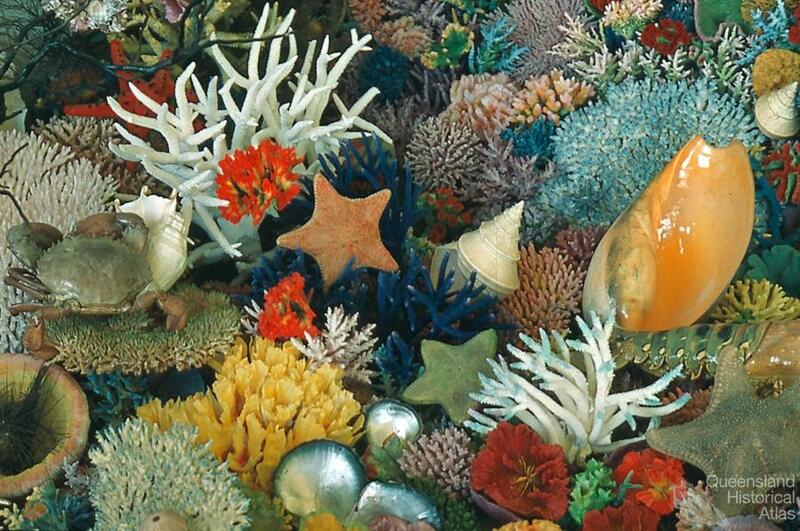 Like the scientists they accompanied, early visitors made extensive collections of shells and corals. Without underwater cameras and colour emulsion these collections became an important means of representing and portraying the underwater. But the activity of holding and handling living creatures was a thrill in itself. Turtles were particularly attractive and interactive because these animals live both on land and in the sea. 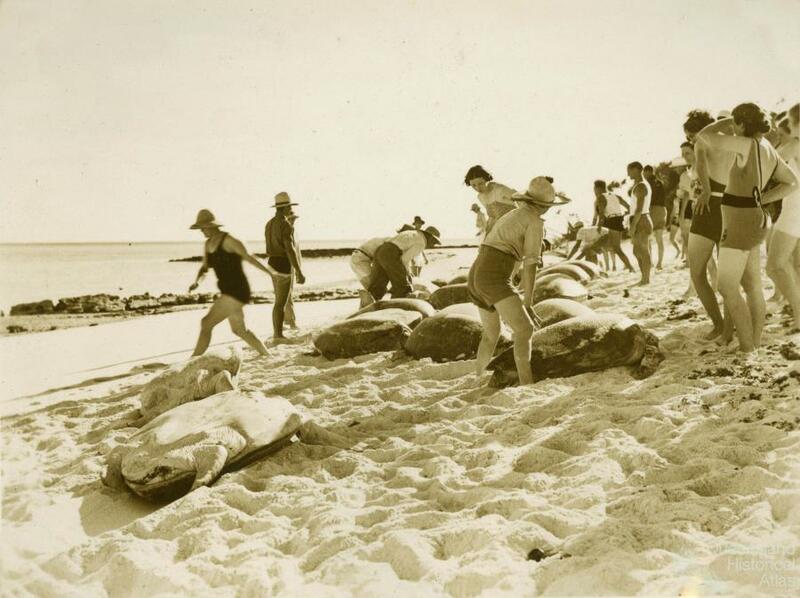 The turtle soup canneries on Nor’West and Heron Islands often served as a base for visiting scientists and holidaymakers. 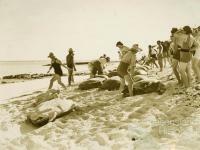 During the turtle nesting season they visited the factories to witness the butchering and processing of turtles for soup. They also developed the remarkable practice of turtle riding. Turtles that came to shore were overturned or tethered until needed for slaughter, and they could also be used for sport. The visitors – scientists and holidaymakers – took turns riding released turtles from the sand into the sea where the turtle took control and unseated the rider. This range of activities is represented in holiday brochures of the time. These highly active and interactive pursuits stand in stark contrast with twenty-first century tourism. Pleasurable landscapes take the form of tropical island resorts; luxurious hotel suites, manicured exotic gardens, and an array of swimming pools. The emphasis is on relaxation, privacy and comfort. The journey to and within the region is incidental to the experience, or even an inconvenience. 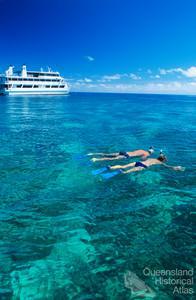 Most tourists remain in the confines of a single resort occasionally making an excursion to the outer Reef. For those who make the journey beyond the resort, the underwater access is unprecedented. 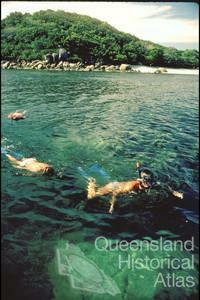 Diving and snorkelling, visitors are fully immersed. They marvel at the visual richness of fish and corals. The weightless and flight-like experience is highly pleasurable. They no longer touch the animals, but experience the underwater world as though they are part of it; as though they are themselves a new kind of fish. Visitors understanding of the landscape – the spatial stretch – of the Great Barrier Reef is increasingly imagined rather than experienced. Tourists will often experience just a single dive location or resort but nevertheless understand this as an experience of the whole region. The sensual pleasures of the Reef are predominantly visual. And through maps, aerial photography and satellite images the complexity of the region is compressed into a single snapshot.